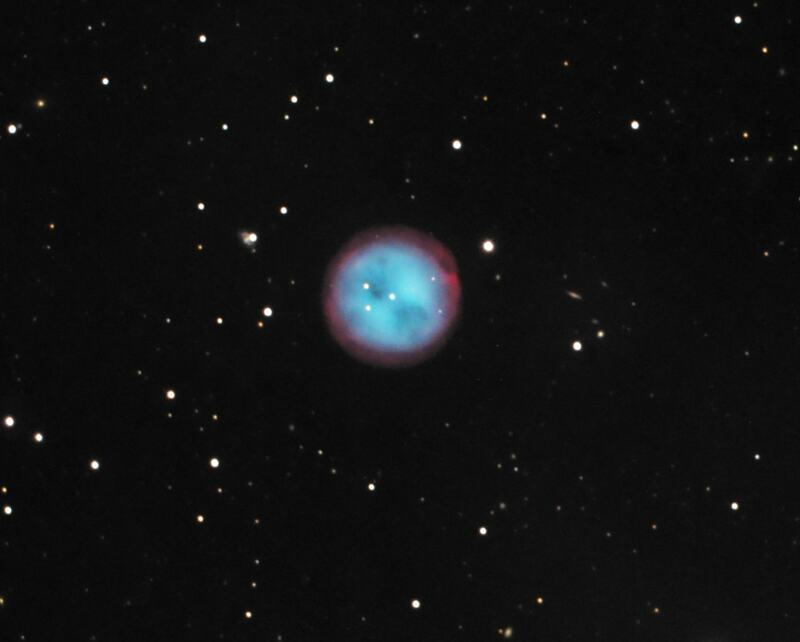 Messier 97 (M97), also known as the Owl Nebula, is a famous planetary nebula located in Ursa Major constellation. The nebula lies at a distance of 2,030 light years from Earth and has an apparent magnitude of 9.9. It has the designation NGC 3587 in the New General Catalogue. Messier 97 occupies an area 3.4 by 3.3 arc minutes in apparent size, which corresponds to a spatial diameter of 1.82 light years. It was named the Owl Nebula because of its appearance in larger telescopes, which reveal two dark patches that look like the eyes of an owl. These were first sketched by William Parsons, 3rd Earl of Rosse in 1848. 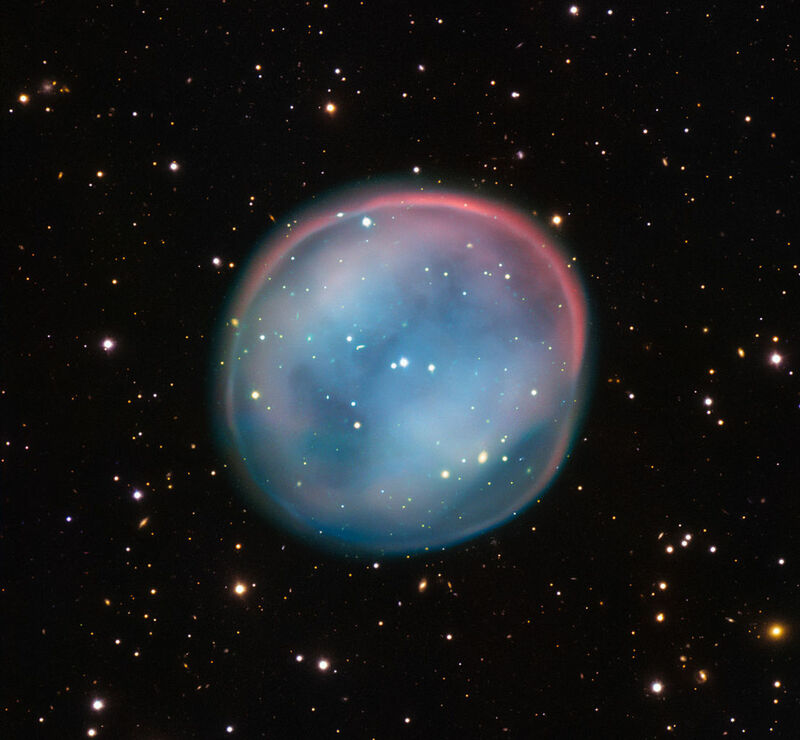 The Owl Nebula can be seen in 20×80 binoculars and small telescopes, but only under exceptionally good conditions, and it only appears as a faint ball of light. The owl-like eyes can be seen in 10-inch and larger telescopes. The Owl Nebula can be found about 2.5 degrees southeast of Merak, Beta Ursae Majoris. 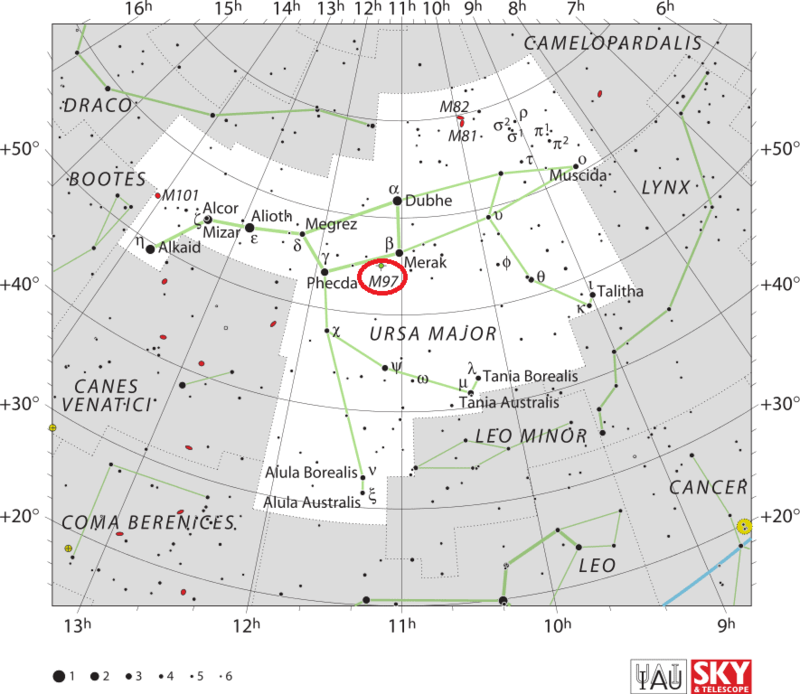 The star marks the southwest corner of the Big Dipper’s bowl and, together with Dubhe, Alpha Ursae Majoris, the star at the northwest corner, it points the way to Polaris. Going from Merak, M97 lies just over 2.5 degrees in the direction of Phecda (Phad), the other star at the bottom of the Dipper’s bowl. Another Messier object, the barred spiral galaxy M108, can be seen 50 arc minutes northwest of the Owl Nebula. 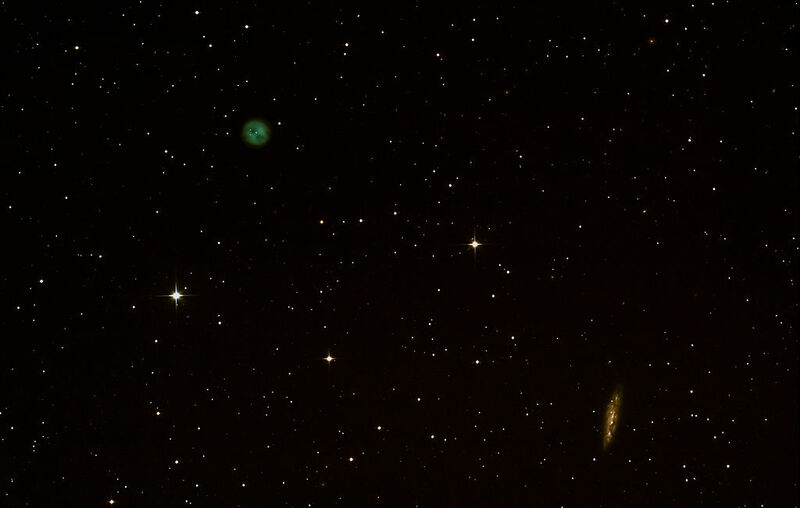 The two objects appear in the same wide field view. The best time of year to observe M97 is during the spring, but observers north of latitude 35N can see the nebula throughout the year, as it never sets below the horizon in for them. Like most planetary nebulae, M97 appears brighter visually than photographically because it emits most of its light in one green spectral line. Its outer halo was not detected until 1991. The nebula formed when a dying Sun-like star ran out of hydrogen fuel, collapsed from a red giant to a white dwarf, and ejected its outer envelope. The expelled material is now heated by the radiation of the central white dwarf, producing the nebula’s glow. The nebula has been gradually expanding and will completely disperse into space over the next several thousand years, while the white dwarf will cool and fade away over the next several billion years. The estimated age of the Owl Nebula is about 8,000 years. The nebula is expanding at a velocity in the range from 27 to 39 km/s. It contains about 0.13 solar masses of material, including the elements hydrogen, helium, nitrogen, oxygen and sulphur. The matter within the nebula has a density of less than 100 particles per cubic centimetre. The 16th magnitude central white dwarf has about 0.7 solar masses and is between 41 and 148 times brighter than the Sun. The star’s estimated temperature is about 123,000 K.
When it collapsed, the central star expelled a large amount of matter in two opposing directions, which resulted in the nebula’s owl-like appearance. The two jets of matter are almost aligned with our line sight, but just slightly off. The dust in the jets blocks some of the light of the expanding nebula, giving it the appearance of two dark eyes. The jet pointing in our direction appears as the darker eye, while the one pointing away from us appears slightly fainter. The M97 nebula is arranged in three concentric shells. The outermost shell is about 20 to 30 percent larger than the inner shell, which is not circularly symmetric and forms a barrel-like structure that gives M97 its owl-like appearance when seen from Earth. The barrel-like structure is aligned at a 45-degree angle to our line of sight. 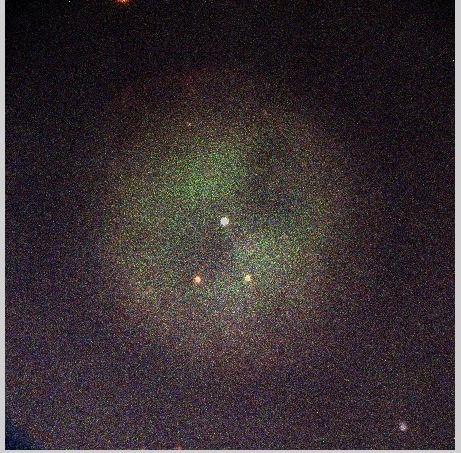 The Owl Nebula’s appearance isn’t unique. The Southern Owl Nebula (ESO 378-1), located in the constellation Hydra, bears a striking resemblance to it. Messier 97 is one of only four planetary nebulae listed in the Messier Catalogue. The other three are the Dumbbell Nebula (M27) in Vulpecula, the Ring Nebula (M57) in Lyra, and the Little Dumbbell Nebula (M76) in Perseus constellation. The Owl Nebula was discovered by French astronomer Pierre Méchain on February 16, 1781. Méchain reported the discovery to his friend and colleague Charles Messier, who added the nebula to his catalogue. In his notes about M97, Messier also mentions two other objects that he observed at the same time. He determined the positions for both objects, but did not include them in his catalogue. From his descriptions, it is clear that he observed the objects we now know as Messier 108 and Messier 109. The two galaxies were given Messier names by the American astronomer Owen Gingerich in 1953. A large planetary nebula, or globular collection of nebulous matter, found by M. [Messier] in 1781, on the Great Bear‘s flank, with several stars in the field, one of which is pretty close. It lies about 2deg to the south-east of Beta, Merak, and just south of an imaginary line from Beta to Gamma. This very singular object is circular and uniform, and after a long inspection looks like a condensed mass of attenuated light, seemingly of the size of Jupiter. The mean apparent place was obtained by a differentiation with that of Psi Ursae Majoris, and this diagram was sketched. Sir William Herschel discovered this orb in 1789, and found it a globular body of equal light throughout: he also say, “From the observation of the 20-foot telescope, it appears that the profundity of this object is beyond the gauging power of that instrument; and as it must be sufficiently distant to be ambiguous, it cannot well be less than of the 980th order.” The 980th order! 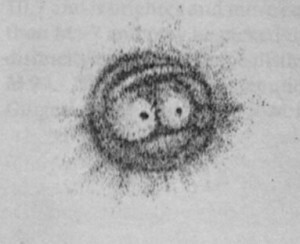 Sketch of the Owl Nebula (M97) by Lord Rosse. John Herschel catalogued M97 as h 838 in 1831 and later added it to the General Catalogue as GC 2343. Large pale plan. neb. ; very remarkable object. h. [John Herschel], 2’40” [diameter], which at distance of 61 Cygni only, would equal 7 times orbit of Neptune. He saw light nearly equable, though with softened edge, and faintly bicentral. E. of Rosse, on the contrary, two large perforations (whence it has been called the `Owl Neb.’), and an indistinct spiral structure. Before 1850, there was a star in each opening; since, one only. William Huggins studied the spectrum of M97 and recognised the nature of the object as a gaseous nebula. The “Owl”’ Nebula. Enlarged 4.0 times from a negative of 4h 12m exposure time. The central star is visual magn. 14 (Burnham), and about 12m photographically. The brighter central oval lies in p.a. 12deg, and the diameter along this line is 199″; at right angles to this direction it is 203″ in diameter to outside the whorls. Aside from the outer whorls all structural details are very vague and indistinct.